Supatra Hua Hin Resort is an exquisite getaway, offering unprecedented luxury and comfort with traditional Thai charm and hospitality. 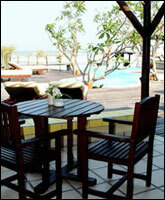 With breathtaking beach front sea view, Supatra Hua Hin Resort is located on one of Thailand’s most beautiful beaches. Listen to the soft rolling waves, be enchanted by the perfect sunset in this tropical setting. Enjoy all this natural beauty while luxuriating in the comfort and nurture of Supatra Hua Hin Resort. - Child under 10 years sharing parent's room, 1 extra bed free of charge on room only basis. Up to a maximum of 1 child per room. - Check out time is 12:00 noon. Request for early check in or late check out will be considered subject to availability. Supatra Hua Hin Resort has a selection of rooms including : Two private pool villas, with enclosed area of private balcony, garden, and exclusive plunge pools. Our Superior pool villa offers a spacious living room for relaxation. Three sea view units and thirteen garden view units, with beautiful view of sunrise and relaxing tropical garden, private terrace, with romantic ambiance. All units feature air conditioning, TV, VCD player, stereo, CD player and mini bar. 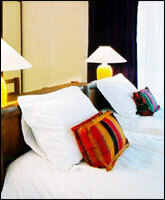 Superior Pool Villa rooms offers all the luxury and privacy for your personal comfort and relaxation. With special living room and large private pool. - Large sofa which can be used as day bed. Pool villa rooms offers all the luxury and style guests expect from Supatra Hua Hin Resort, with private plunge pool and spacious living space. 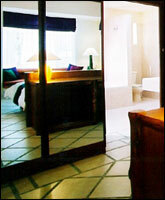 Garden view rooms offers view overlooking the luscious tropical garden. Sea view room offers a stunning view of the sea and the pool. As you enter Supatra Hua Hin Resort, the enchangting garden overlooking the glittering sea and breathtaking view of the mountain will captivate your every sences. This Luxurious and peaceful romantic resort will pamper and rejuvenate your body and mind. Service is provided by our attentive staff who take personal interest in your comfort. Acasual beachside restaurant and bar is the perfect spot to dine while watching the sunset over the sea. Private pool villas are specially designed wit verandah, plunge pool, and enchanting garden. Open daily from 11.00 hours till 23.00 hours. Our famous Supatra by the Sea restaurant is one of the most romantic place in Hua Hin. Gourmet style Thai and Seafood cuisine are served with the freshest ingredients and succulent taste. Every meal will be an unforgettable experience for your senses. Open Daily from 7.00 hours till 21.00 hours. The Ocean View Café is an ideal place to enjoy a perfect meal anytime of the day while lounging by the pool or sipping refreshing tropical fresh fruit juice on the sun deck. The Café features an array of light meal and snacks for all tastes. The Swimming Pool is design for the pleasure of our in-house guests; the overflowing pool feels like it stretches out into the sea. 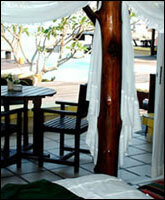 Here our guests can soak up the tropical breeze and quietly sunbath on the sun deck. Refresh can be sended by the pool from our Ocean View Café. Flight reconfirmation, golf excursion, beach horse riding, and a variety of sea-sport are available on request.